Five of our successful candidates for the British Riding Clubs Senior Horse Welfare 3 certificates proudly display their scrolls. There's a regular programme of all sorts of Riding Club and BHS training schemes under way at the yard. Let us know what you are interested in, and we can organise it! There are always programmes of training under way at the yard, from basic riding instruction through specialist exams and courses. Kirsty is a BHSII-level instructor and can take you and your horse or pony to whatever level you are aiming for. For example, through the various Pony Club exam levels; Dressage; Riding club events; One-day Eventing; Show Classes etc. 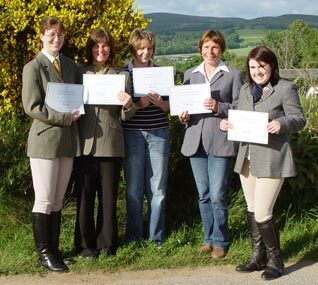 Kirsty is an experienced judge at local and national shows, and a Panel Judge for the Highland Pony Society. Or 'from the ground up': sensible and confidence-building tuition on your horse for beginners, right through to where your ambition will lead you . . .